He showed a photo BCPs at 3400-3500 m: it’s definitely dried looking than Almagre. He described the substrate “if you can call it soil”. He showed graphs from Lamarche et al 1984 and Graybill and Idso 1993. Sheep Mt was now said to have 300 samples and to go to 2005 (also mentioned Pearl Peak, Mt Wahington). Showed chronologies which visually were not small in recent years. He showed a picture of a core along the lines of pictures shown for Almagre at CA showing relatively wide recent widths as compared to the 19th century. He showed a plot with 50-year bins back to 3000 BC or so showing that the present widths were the widest since about 2000 BC (when there was also a period of wide ring widths). He said that the increase could be attributed to temperature increase citing temperature stations at Barcroft and Crooked Creek. Ababneh Fig. 5. 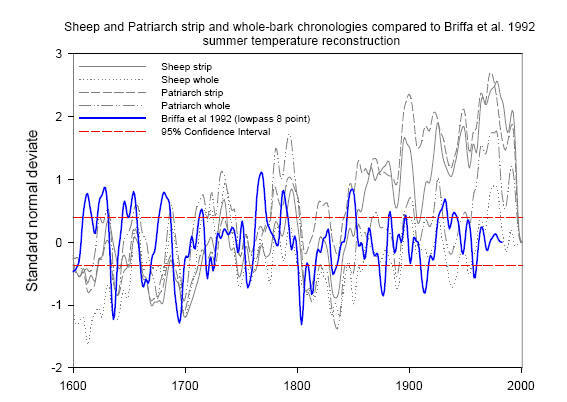 Cold and warm periods as inferred from tree ring widths chronology (Ababneh, 2006, This study) fluctuations above and below the mean after normalizing, whole-bark and strip-bark chronologies are grouped together from two sites Patriarch Grove and Sheep Mountain. Linah Ababneh’s result are different than the results presented at AGU. Malcolm Hughes was on Linah Ababneh’s thesis committee but did not mention her work which arrived at different conclusions than the ones presented here. Linah Ababneh’s thesis said that the data would be archived at ITRDB, but Hughes and her other thesis supervisors did not archive the data. David Meko said that they had lost track of Ababneh although she was easily located. When asked about the data by a CA reader, she said that she had legal advice not to provide the data to me. Why didn’t Hughes acknowledge the efforts of Linah Ababneh in collecting Sheep Mt data, while acknowledging the efforts of Matthew Salzer? Why didn’t he discuss her conflicting results? This entry was written by Stephen McIntyre, posted on Dec 13, 2007 at 9:35 AM, filed under bristlecones and tagged Ababneh, bristlecone, hughes, salzer, stripbark. Bookmark the permalink. Follow any comments here with the RSS feed for this post. Both comments and trackbacks are currently closed. Interesting considering Ababneh even won an award in 2002 for her work on the bristlecones. Was there any Q&A opportunity at the end of his talk where he could be asked about the subject? It seems to me the future is in younger researchers, like Linah. They ought to be encouraged to keep their promises to provide data AND eventually they will find the courage to face down the fossils that will (in 20 years) be retired or dead. >> she said that she had legal advice not to provide the data to me. I found this fact disturbing and interesting. If I understand correctly, she was a grad student at this university. Given that she could notpossibly open herself up to legal liability by publishing her own data, I’m speculating that the legal advice came from her personal attorney, and that the only source of legal threat comes from who ever owns the data (universtity?). If she collected the data herself, then it’s hard to see what she is afraid of. Do they still have some leverage over her? When one submits what amounts to a homework assignment, IP rights are not transferred to the school. Can someone ask her “what is the basis for the legal advice”? 10, if someone can mine the CA archives over the past few months, there was a more complete explanation. I seem to recall someone saying something about it being Hughes’ attorney, but I don’t remember whether that was speculation or information. Can we please not go through all of that again? Surely it was done to death already. 12, ok, then please summarize. It’s curious, also, how volcanic activity subsides (Salzer’s last citations of 1836, ’38, ’40 and ’42 don’t seem to interfere) with the advent of the modern hockey game. See also from comment 18 onwards. The data must be good. It agrees with the models. If we take Hughes and Salzer data at face value and discount Ababneh’s contrary findings then what we have is BCPGW not AGW, since none of wht Hughes argues undermines in any way Steve and Ross’s original results, namely, take BCPs out of the equation and the hockey stick disappears. If so, then the issue reverts to transparency in scientific research and Hughes and Salzer do not have a fig leaf to hide behind. Namely: “If the hundreds of other volcanoes you cite” can correlate with reductions in ring width, why don’t these eruptions? (Salzer was the primary author of Bristlecone Pine Tree Rings and Volcanic Eruptions Over the Last 5,000 Years, (2005), and Hughes secondary). Obviously those volcanoes failed to teleconnect to the BCP’s properly. 1990s and early 2000s at Sheep Mountain … generally speaking, good snow pack. Decent mid spring snow dumps. Here are some real standout years – 1992 – 93, 1994 – 95, 1995 – 96, 1997 – 98, 2003 – 2004, 2004 – 2005, 2005 – 2006. Some of these were El Ninos and some were “wet” La Nina / neutral (typically accompanied by multiple strong Tonapah Lows). some times old farts should just retire, before they become bad men. My guess is that she is a true believer and inadvertantly followed the evidence. Prior to Steve M, they really didn’t need to be so careful. What are the odds that a skilled auditor would take this much personal time? Is it too late to bring out the “Free Linah Ababneh” and the “Linah Ababneh is Innocent” t-shirts in time for Christmas? 26, holy moly, how many dendrochronologists does it take to count tree rings? To be fair to Hughes, there may be a problem with the way the Ababneh data was collected, which might also explain the lawyer thing. They have created quite a little fiefdom there at U of A in BCP tree ring study. Not surprising, though, when you consider how much they push the AGW stuff down there. And as Anthony Watts also discovered, Arizona State University has one of the most notorious USHCN weather station in the middle of a parking lot. Sorry, I’ve done this before, but seem to be forgetting something. The answer, of course, is none as it is too hard and costs too much. Over at RC just now they’re hosting a discussion on changing Ptarmigan grazing patterns (seriously!) Part of my post asking when we can expect the same level of diligence to be applied to BCPs was deleted as “Off topic”. Go figure? How ’bout we give a “Don’t Taze Me, Malcom!” shirt to Linah? Yah, don’t taze me bro-has! The Arizona system has not been very honest in this field. I did some research into them blocking Steve from their data base, and basically they stonewalled. Ignore whatever data you like Dr. Hughes, we’re behind you all the way! 35, it gets easier the more times you do it. This is why I have supported, and will continue to fund your efforts. What you have done with the Bristlecone Pine Tree Rings, is beyond outstanding. Linah Ababnehs result are different, and that is very informative. She concluded that rainfall was the most important aspect of tree ring growth. How do we settle this debate? Measure the sediment layers in the lakes closest to the sampled trees. High rainfall will increase the amount of sediment that was deposited in the lake. Why has such a simple measurement been totally ignored? I find it peculiar that strip bark and whole bark BCP’s should have the same ring width excursions over the same years and growth conditions. This result implies that each BCP maintains a constant growth rate in its remaining cambium, following bark-stripping. To do so, each such tree must renormalize its metabolic activity to its own percent of bark coverage. That is, as the bark is stripped off across the centuries, by whatever happenstance, each such tree scales down its metabolism linearly with the percent of remaining cambium, resulting in a constant depositional ring-width. That’s the only way strip bark trees could maintain a linear living-cambium ring-width correlation with whole bark trees. Naively speaking, I find that very hard to believe. I’d further bet that there is zero evidence that BCP’s, or trees of any sort, inversely re-normalize their metabolism to bark coverage. Not only that, but we’d have to assume that strip-bark BCP’s also lay down constant ring widths all the way across the remaining live-cambium surface. There should be no non-linear, e.g., horizontally conical, growth pattern across the remaining bark-strip. If there were, then a non-linear ring-width time series core would necessarily result, unless one judiciously chose to selectively core the region of the remaining living circumference that manifested rings remaining in concert with the underlying tree rings that reflect the pre-stripped, whole bark tree. That region would be somewhere around 25% in from the edge of the bark-strip (this point would vary with the shape and asymmetry of the ring-growth). To do this one would sample one’s way horizontally across the living bark, and then choose the core that showed the best linear extension from the underlying pre-stripped ring widths across the historical time region in which the bark was stripped. Doing so would, of course, amount to cherry-picking one’s core and imposing one’s conclusion. WRT the trees themselves, it seems much more likely that a strip bark tree would compensate for loss of bark by laying down thicker rings in the remaining living cambium. It shouldn’t take many core samples, or perhaps crosscuts, to check this. Tree response to bark-stripping could be further checked, however, by correlating leaf coverage with bark coverage. Leaf surface area is a measure of photosynthetic activity, and so should be a measure of metabolic activity. One could correct this further by renormalizing leaf surface area to chlorophyl greenness. If ring widths are constant no matter the bark coverage, then the (leaf photosynthesis)/(bark coverage) ratio should be a constant across BCP’s, whole bark and strip bark. One should also control for root-growth, but on first pass could assume that in mature trees metabolic activity is equi-partitioned, and root turnover and ring deposition are approximately linear as well. A plant biologist could probably make a rational judgment here. In any case, I think Malcolm Hughes’ claim about constant BCP ring widths no matter what barks requires considerable examination. The fact that there is so much secretiveness, hostility, and obstruction attendant to this work only encourages suspicion that something is not right. Science should be entirely transparent. Dr. Ababneh’s reference to a laywer’s advice on release of data is entirely inappropriate to the ways of science. It implies that she’s (been) frightened. Re: Pat Frank (#40), The Pat Frank on comment 40ff isn’t the one — me — who has been posting for years here on sundry threads about AGW and tree ring thermometry, works at Stanford, and wrote the Skeptic article. From a sheer logic your point is well taken. At the very least assuming that the bark stripping is in response to some form of stress there should be some impact on the growth rate. Perhaps we should wait to hear Hughes’s explanation. It appears a number of his colleagues focus on the impact of stress on trees – so I assume that they have had some input into his assertions. It is all very puzzling. Just based on logic and some pretty basic empirical assumptions your point is well taken. At the very least assuming that the bark stripping is in response to some form of stress there should be some impact on the growth rate. Perhaps we should wait to hear Hughes’s explanation. It appears a number of his colleagues focus on the impact of stress on trees – so I assume that they have had some input into his assertions. It is all very puzzling. We should not jump to conclusions. Hughes may have made an error in grammar. I’d ignore the Ababneh page(s) at LTRR — more than a year old and she’s no longer there. I agree with the above posting that suggests the likelihood she’s been frightened by someone or something. To that end, I would encourage following Steve’s earlier advice: leave the poor lady alone. There are bigger fish to fry. Here’s something else to think about. Thuja occidentalis found in harsh growing conditions exhibit the same strip-bark habit found in BCPs. It might be inferred that the two species are reacting in the same way (ref 1). Experiments show that there is a relationship between the roots and the shoots called radial architectural segregation or sectored radial architecture that isolates sections of the tree crown to particular sections of the root system (refs 2, 3). If this is the case, it may be that the moisture and nutrient regimes for particular roots are controlling the growth for different sectors of trunk. It’s as if the plant has divided itself into nearly separate individuals. Gary, read the blog. Steve M knows just about everything there is to know about cedar, with several threads devoted to the topic. In fact it was Jacoby’s Gaspe cedars that MBH98 had inserted four placeholders into in order to ensure that the AD1404 chronology was included in the AD1400 step. Why did he do this extraordinary data manipulation? Because he knew the Gaspe cedars had a HS shape to them and he wanted to ensure that shape came out in the AD1400 reconstruction. ‘twould be interesting to have access to those papers. From what I’ve heard via Leslie H, while the connection may be as simple as sectored radial architecture close in to the tree, it gets far more complex and less predictable as you look further out to where actual uptake of nutrients occurs. There’s also a far more complex hormonal interplay between roots and shoots than was previously anticipated. Is this reverse causality at its best? Should it not be that the species show cambial mortality when at great age (as they approach death)? What proof is offered that reverse causality can be ruled out? It is tricky to assume too much about tree growth if you have not had hands-on. I can cut a tree of some genera completely off at the base, a foot above the ground. Many times, it will throw out suckers which can become quite ancient in their own right. Some can seem to fuse with the base to give a circular shape that looks as if it was never disturbed. Now, imagine the ring counting problem if you sampled the stump as opposed to the sucker. Or, for a nasty twist, if you went through the junction with your corer at an angle. I have often seen trees decapitated by tropical cyclones growing again next Spring and I have to assume that a fair portion of the trees I see in cyclone areas are not good dendro candidates because the count has started from zero again above a certain height. Cyclone Tracy at Darwin stripped some to much of almost every tree for 50 miles square. Lightning, termites and fires can cause similar effects. There is no guarantee that the tree you sample today is the tree that was there 200 years ago. I have seen many historic trees older than 200 years, but dendro does not work on them because of the sucker problem. They are recorded in history books that have survived, especially seen in China. One was there when Kubla Khan came through. Trees can adjust metabolism to cope with cambium disturbance. The example of cutting off at the base is a fairly drastic cambium interference. The tree will commonly not die immediately following beheading. Indeed, in ornamental horticulture at least, this is a standard way to prepare for a cleft graft. The cambium will spread over the gap between the bottom stock and the inserted scion, usually in weeks to months, and telecommunicate again. The tree will grow, but with an interrupted history of rings above the graft. I agree. Some hormones and many nutrients can be applied as foliar sprays, with little to do with root involvement. I’d guess that a die sprayed on the outside of leaves might penetrate into twigs, but I have not tried this. Chlorophyll can take this path in the Fall. The more I read CA, the more I feel that what is NOT said in climate science papers can be as important as what is admitted. In reviewing earlier parts of this discussion which are in previous threads, I encountered the information that some part of her thesis work was funded by an outside entity (Bristlecone section of a Calif. nature group – sorry I didn’t copy the exact name). Maybe that is part of the release problem, two groups have to sign off on it? I’ve been reading the blog for over two years. My point isn’t the HS or the Gaspe cedars; it’s the plant biology. Radial sectoring means that shoot cambia of individual bark strips are dependent on the conditions of their supporting roots. This adds another level of uncertainty to the idea of trees as thermometers – one individual is likely recording different conditions in different sectors. Suppose a root is damaged – cambial growth declines until the injury is repaired. Suppose a root grows into a moisture pocket – cambial growth is enhanced. Another root/cambium sector is subject to neither extreme. All three conditions would produce different ring structures and different interpretations of climate. Yeah, that sounds backwards. You get the point about plant responses to environmental conditions within the constraints of their genetically controlled limits. #46, 53. At a very early stage in our studies, Ross and I spent a day with Doug Larson and PEte Kelly (who are both at the University of Guelph, as is Ross) and got a good lesson in the radial sectoring issue. One of our Almagre samples was an exposed root, from which we took a core. The root had quite a distinct low-freq pattern from the stems, something that we’ve not attempted to interpret so far. Larson and Kelly very much thought in terms of cliff cedars almost “mining” for nutrients and moisture and occasionally getting into good ore zones. It also seems quite plausible to me that the competition between bristlecones in these dry areas is at the root level rather than the canopy level. It has a long history of usefulness. Many ancient English houses are built of oak from coppiced trees. Temperature is the most important factor affecting growth at high altitudes. As trees use much of the allocated carbon gained from photosynthesis to produce branches and stems, information on the timing and dynamics of secondary wood growth is crucial to assessing temperature thresholds for xylogenesis. We have carried out histological analyses to determine cambial activity and xylem cell differentiation in conifers growing at the treeline on the eastern Alps in two sites during 2002-2004 with the aim of linking the growth process with temperature and, consequently, of defining thresholds for xylogenesis. Cambial activity occurred from May to July-August and cell differentiation from May-June to September-October. The earliest start of radial enlargement was observed in stone pine in mid-May, while Norway spruce was the last species to begin tracheid differentiation. The duration of wood formation varied from 90 to 137 days, depending on year and site, with no difference between species. Longer durations were observed in trees on the south-facing site because of the earlier onset and later ending of cell production and differentiation. The threshold temperatures at which xylogenesis had a 0.5 probability of being active were calculated by logistic regressions. Xylogenesis was active when the mean daily air temperature was 5.6-8.5°C and mean stem temperature was 7.2-9°C. The similar thresholds among all trees suggested the existence of thermal limits in wood formation that correspond with temperatures of 6-8°C that are supposed to limit growth at the treeline. Different soil temperature thresholds between sites indicated that soil temperature may not be the main factor limiting xylogenesis. This study represents the first attempt to define a threshold through comparative assessment of xylem growth and tissue temperatures in stem meristems at high altitudes. I wonder if soil temperature was limiting root initiation at Yamal until the mid 1970s. I wonder if that is the process responsible for “divergence” in general. North slopes vs. south slopes. Root initiation is a temperature-thresholded process. A tiny bit of warming could have an amplified effect on root, and therefore radial, growth – by significantly boosting the length of the root growing season. Cold soil is bad. I believe I proposed that mechanism for bcps in California here at CA … but before I understood the stripbark process. I wonder how much divergence there will be within the Yamal samples. And if there is, if it can be correlated to site aspect. Whatever happened to Martin Wilmking? Didn’t he promise to figure all this out? bender – cold soil is discussed in some of the early literature on BCP growth (Fritts did a technical report in the 1960s). Temperature is the most important factor affecting growth at high altitudes. Of course, water, nutrients and wind have no effect at all. And this of course doesn’t correlate at all with the rainy seasons. RE: #39 – In the case of Sheep Mountain, I suspect that snow pack survival is the controlling factor. Years where the snow pack does not survive until a certain point in June are lower growth, years where it survives to that point are higher growth. The moisture content of the poorly developed soil in that locale is going to depend, ni most years, on the snow pack factor. Generally speaking, summer convection is unrealiable and generally cranks up too late in the season to greatly influence growth. Prime time is June 15 – Aug 1, so snowpack is going to determine it. RE: #46 – Niagara Escarpment is in a Humid Continental Climate with a summer precip max and where, generally, the snow is gone before the soil thaws. Sheep Mountain is in a Mid Latitude Steppe / Desert Climate with some Mediterranean influence, with a winter precip max and in many years, there are late spring snow events after soil thaw has commenced. Apples and oranges. RE: #57 – Totally different climate than Sheep Mountain. BCPs are more like cactus than other types of pines / other conifers. I find it peculiar that strip bark and whole bark BCP’s should have the same ring width excursions over the same years and growth conditions. This result implies that each BCP maintains a constant growth rate in its remaining cambium, following bark-stripping. Pat, from my observations over the decades, there’s little transverse movement of sap/nutrients across bark. IOW, if a circumferential section of tree-bark dies, the roots & branches in-line w/this section also eventially die (couple of yrs). #63 — beng, thanks. I gathered something of that from the interesting abstracts about radial sectioning that Gary posted (thanks, Gary) in #46. But the question is whether the remaining living circumference continues monotonic ring growth; that is, growth that remains a linear extapolation of the ring width trend prior to the bark stripping. A reason for my mention in # 49 of decapitation then cleft grafting is that there really has to be some radial movement of sap to achieve a final circular pattern the same diameter as the stump, from a graft initially a few mm wide at one point on the cambium circumference. So radial transport cannot be ruled out entirely, though it might not be major. How major and how fast remain unknown to me. Agreed in degree, but photosynthesis in canopies is a valid process and part of the reason for growth. The leaves do play some part in ring width; without them one is on an asymptote to zero. Whether leaves play a controlling part, or whether it is the roots, is one core aspect of the sub-problem. Would be interesting to run the radial sectoring investigation upside down; that is, remove and keep removed part of the canopy and see if, over the years, the rings below the removed part ceased to function. My guess is that they still function, but at reduced activity. A related problem is whether the cambium above the strip-bark wound still functions. Simply look at the complexity of the sulphur cycles and pathways and their interactions with other growth controllers. SO2 forms aerosols, might change cloud/light availability, forms acid in soil that can affect availablity of about a dozen nutrients, releases CO2 from carbonate nodules and rocks, can be absorbed by both roots and leaves, could change predator levels and growth hormone effects, soil biology levels, accelerates soil from rock conversion rate and clay content, with attendant ion exchange capacity, water retention properties etc etc. As a general observation, some root diseases like armillaria fungus and phytopthora start at a root point, but the tree seems to die overall from tender new leaves inwards. So these pathogens seem to have some ability to avoid radial sectoring. The whole subject of tree rings is complex. I claim to know only a little about it, but it seems that each increment of research reported by reconstructionists opens up multiple new lines for inquiry. Another problem is that short studies of plants, like dye penetration, might not relect growth processes over centuries, (as I’m sure you’ll agree is a big problem in reconstructing geology). Until these various complexities are understood, I tend to forget about temperature because that is approaching a structured investigation from an erroneous direction. The oft-repeated assertion that high altitude trees under stress to survive and very old, are most suitable for tree ring studies, smacks a bit of selective sampling. Where is the boundary between OK and not OK? Is it sharp or gradual? Getting the logic backwards. After a windy storm in Tasmania, a TV crew interviewed a local farmer, saying how strong the winds were. “Yep”, he commented. “Blew down a lot of trees that hadn’t been blown down before”. * When our fruit trees’ roots are attacked by moles, the trees die – 100% of the time, and rather quickly. ***We don’t have earthquakes, hurricanes or tornados here (we just call it “high wind warning: 60mph winds with 90+mph gusts.”) But we get lightning and we get hail. Several years ago, sixteen inches of hail fell in one storm. Our greenhouse survived. A friend’s mini-observatory did not. This year we had a storm with a LOT of golf-ball hail, and quite a few billiard-ball hailstones. Hail like that strips trees of all leaves – “winter” trees in summer, with a strange green “snow” on the ground 😦 … oh, and our truck required replacement or repair of every body panel plus some glass. Fortunately, our new Class IV roof was fine. Thanks for that you tube link. I’ve not been paying any attention to that man behind the curtain fo quit esome time now thanks to our resident ‘toto’. Archeologists recognize that prehistoric human populations were a significant variable in the operation of past California ecosystem processes, and that a changing environment created constraints and opportunities for prehistoric cultural adaptation. The tie between paleoclimatology and archeology is an evolving interdisciplinary field of study that aims to facilitate a better understanding of prehistoric subsistence-settlement patterns relative to climate variability. A paleoclimatic model based on temperature inferences and precipitation reconstruction from tree-ring widths of bristlecone pine in the White Mountains of California is used to explain the distribution of prehistoric alpine villages in the White Mountains. The paleoclimatic model is visually and statistically compared with calendar ages converted from calibrated 14C dates from the village sites. Results elucidate the role of water availability in the frequency and intensity of settlement, as 88% of the calendar dates associated with 14C dates fall within wet periods (α=0.05, p=0.005). The coincidence of the calendar dates around above average precipitation periods confirms that long-term available resources are contingent on the availability of moisture, the key to life in the desert environment. Yes, we had that once in McLean, VA (close to DC) when I lived there. There were ruts in the ‘green snow’ on the roads from traffic, just like you get with the white stuff. I saved one of the hailstones (bigger than a golf ball) in my freezer but it sublimed away….. I know when you say “here” you’re not talking about the plains east of us front-rangers, towns such as Holly. The town was “totalled”. My mom grew up (’30’s) in Eastern Colorado towns where tornado shelters were fairly common. The following link, (p. 3) shows tornado counts since 1988, which I believe is the year I watched from my condo window in west Denver as a funnel cloud dropped out of the sky, worked its way down Broadway a short distance (whacked a car dealership I think) then disappeared. Holly event was the first tornadoe-related death in Colorado since 1960, according to article. No stories like Dorothy’s, but we get them. Very pedantic of me, but fun in a “twisted” sort of way, to look it up. Pete: You must be reading the entries here about root/shoot compartmentalization. The Brunstein article about bristlecone growth characteristics (Steve Mc. cited some time ago, along with the cross-sectional shapes, in regard to coring anomalies) has some interesting observation about “sediment damming” on upslope sides of bc pines, and its relationship to the root formation (the latter causing as well as responding to the former), soil moisture retention, branch and strip-bark growth formation, undercutting of downslope root anchorage, long-diamer bearing, etc. (too much to repeat here). One thing I took away was that about 26 of 33 old trees (aged 1,000 – 2,000 years), or nearly 80%, had the bark strip on the upslope side. It’s a big PDF file (23 MB), but his pictures/sketches (really artwork) are superb. Very slow-going, very un-Acrobat-ic, which may have discouraged some readers. 20th century divergence is such a ubiquious pattern. Occam’s razor says it has to be a universal mechanism. Alipne soil is universally cold. The Ababneh update trends up. Just not as far up as Graybill. Polar Urals trends up. Just not as far up as Yamal. Other Yamal chronologies trend up too. bender, Esper discusses the Divergence Problem in a recent Climatic Change commentary – as an adverse comment on an article by Craig Loehle on reconstructing temperature from upside-down U-curves. An exchange that I’ll try to report on. BTW, how is Craig’s surname pronounced, Lo -el le, Lo -ly, Lo -el, Lole or some other way? Steve, are there enough samples in the raw Yamal data, and enough metadata – to check if the slope of the uptick varies according to aspect? I bet the metadata don’t even include aspect. But depending on the precision on that lat/lons, you could look it up from a digital elevation model. metadata – you kidding me??? For example, the Avam-Taymyr metadata doesn’t even show which site a sample is from – and the sites are 400 km apart. I’ve started a new Yamal thread. ping – the new Salzer, Hughes paper appears to be a writeup of Hughes’ 2007 AGU presentation. I’ve also received some correspondence in the past year from a scientist who knows Linah Ababneh and vouches for her in very positive terms. Any sign of any supporting data? Or is Hughes still working on them? Steve: Supporting data has been placed online in commendable fashion. I’m working on an analysis. I have been trying to read the tree ring files using both your progamme (make.rwl) and the dplR library with hiccups in both methods on some of the rwl files. I am writing up my own script. I also noticed a lack of uniformity in the files with regard to end-of-data values and number of digits in the values. Are there soem glitches in the files as well or is it just me? Steve: Roman, I’ll post up collations in 2 minutes to save you time on clerical work. I had to do a couple of tweaks to make.rwl. You need to use the widths option widths=c(7,5,rep(6,10)). Also I had to specify the first item as a factor using colClasses. Ill also upload modified make.rwl in two minutes. QCed collations in my usual style will be in CA/data/salzer. I got my script working. There is a small glitch with mwa_rwl, and only in one spot I haven’t identified yet. My method uses readLines and then I parse the lines to extract the data. It is quite fast in its execution. Found the glitch in mwa_rwl. It wasn’t in my R script. There are two consecutive cores labelled MWA069x in the file. They start in the same year, but consist of two different sequences of ring widths and end at different times. See? Anyone can do it!